Stone Brothers Racing (SBR) returned to the Townsville street circuit this afternoon with all guns blazing in an awesome display of driving and strategy to bring home their three Falcons in the top ten. First across the line for SBR was Alex Davison in the #4 IRWIN Racing Falcon. After another arduous qualifying session that left him languishing in 22nd place for the start of the race, Davison was looking at a hard day ahead of him, but with a dramatically improved car post-qualifying – and the added benefit of having two sets of the softer compound tyre at his disposal for the race, he kept his head down and punched out 23 clean laps before pitting for his first set of softs. From there Davison’s IRWIN Racing Falcon was a different beast, and in a convincing display of speed he was able to progress through the field and finish just shy of a place on the podium in fourth place. 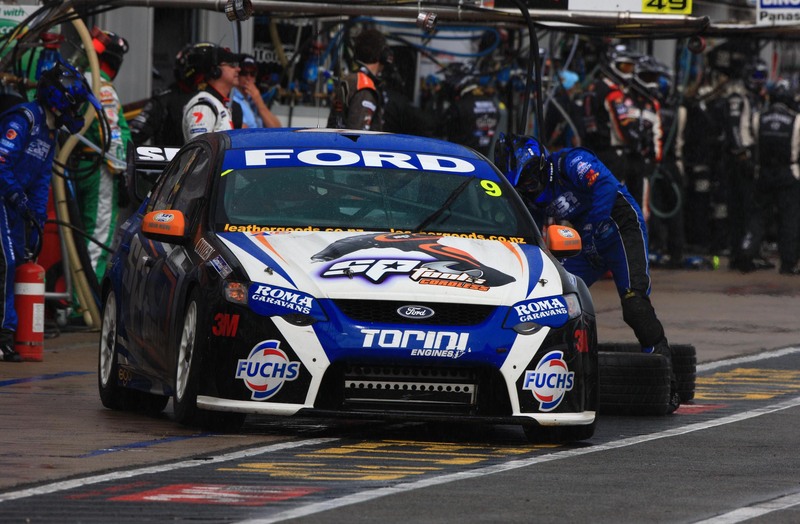 Next home for SBR was Shane van Gisbergen in the #9 SP Tools Racing Falcon, who ran a hard fought race to finish in fifth place. After an improved qualifying performance that saw him start the 74-lap race from 11th, van Gisbergen paced himself early on the harder compound tyre but was eventually passed by team mate Alex Davison who was on the faster soft tyre just before a Safety Car was called – meaning that during his ensuing pit stop for soft tyres, van Gisbergen had to queue behind the #4 IRWIN Racing Falcon in pit lane which cost him several track positions. This although wasn’t a deterrent to van Gisbergen, who again carved his way through the traffic in a car that was obviously much more suited to the softer compound tyre – which van Gisbergen took full advantage of to come home just behind Davison. But the drive of the day in the SBR garage went to Tim Slade in the #47 Lucky 7 Racing Falcon. Like Davison, Slade had an extra set of soft tyres for today’s race and used them brilliantly to post not only the fastest lap of the race, but consistently be one of the quickest cars on the track over the 74 laps. With a much better qualifying session giving him 14th place on the grid, Slade started the race on the harder compound switching to the faster rubber on lap 26. From there Slade was unstoppable – firing his way up into fourth place in what was easily his best performance to date. But like almost every other time Slade was enjoying a fast car and great track position, disaster struck – this time in the form of an overzealous James Courtney who punted Slade out of podium contention on lap 48. By the time he straightened himself out he rejoined the race back in 23rd place. An obviously fired up Slade found another level of d rive on the run home, blasting his way 16 positions forward in the last 25 laps for a strong seventh place. Today’s great result sees van Gisbergen hold his third place on the Driver’s Championship points ladder, 180 behind second placed Craig Lowndes – Davison slips back one place to ninth, and Slade maintains his 13th place. SBR also retains its second place on the Team’s Championship ladder.